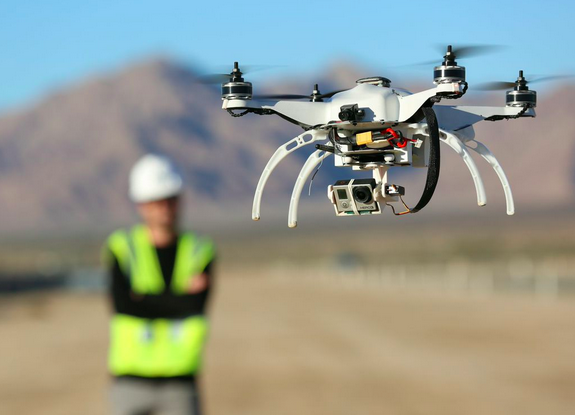 Drones to Monitor Construction Jobsite Productivity? Big Brother (or Sister) isn't just watching you. These days he or she may be buzzing over you in a drone. Drones are already currently being used in limited ways within the construction industry, almost exclusively to map and photograph pre-construction worksites. But a California construction firm has taken this to another level. A regional subsidiary of industry giant Turner Construction has commissioned civil engineers at the University of Illinois to try a novel new method of monitoring project progress and improving work efficiency. The technique? Observing work site photos. That's nothing new. But the way in which the photos are obtained are. The construction project is the new multi-million dollar arena being built in downtown Sacramento for the city's basketball team, the Sacramento Kings. Operated by professional “pilots”, the drones in construction buzz around the growing arena a couple of times a day, photographing work. Images are taken in video format. Back in the lab, the video film is then converted into a 3D photograph which can be compared to architectural renderings and work plan schedules with the help of specially developed software. This software allows managers to see not only how work is progressing but if work is falling behind in certain areas. Managers can then make corrections and improve productivity. These drone "efficiency experts" are also being used on construction projects in Arizona and Japan. It is not at all unusual for work to be photographed on construction sites to chronicle progress. And it's also not unusual for firms to send observers to sites to observe workers to make sure that they're working. University of Illinois project manager Mani Golparvar-Fard anticipates that firms will use this data to correct supply problems and develop more effective work techniques, not check up on workers. And many office environments are now training computer cameras on employees to monitor them during the workday. But that practice, as well as construction's "spies in the sky" is causing controversy. Questions have been raised concerning employee privacy. And while drones and related technology costs have plunged recently, the FAA will soon be rolling out new and tougher guidance concerning drone use for non-military purposes. Still, industry watchers think drones may have some use at construction sites in terms of improving communications, planning, and coordination, the "Big 3" in terms of project slow down. Rather than fly around a site continuously, the construction drones may erect fixed cameras instead. And other types of stationary video monitoring at sites are being considered as well. Still, the debate of drones as construction site observers is not finished. So when you're next at a site and a drone ambles by, it may not be lost. It could be a supervisor, just wondering how things are going.